After about an hour of weaving up and down the winding, mountainous, two-lane highway that is route 58, eastbound from San Luis Obispo, I honestly started to wonder where 9 million solar panels — one of the world’s largest operating solar panel farms that was built in this region — could be hiding. I passed a herd of ranch buffalo that stared lazily at my car from behind a barbed wire fence, then a tiny winery hidden amid a forest (unfortunately, not open for public tastings). But mostly, it was just endless hills of patchy farm land interspersed by dense forest. Then as the elevation started to flatten out and I was just about to pull over to recheck my GPS coordinates, large electrical lines appeared in the distance. They weren’t the kind that connect to the wooden street poles around your house, but big stocky transmission systems that are meant to deliver large amounts of power over very long distances. I knew I was almost there. The mountains gave way to a completely flat, misty plain made up mostly of farm land with grazing cattle, and a few rancher’s homes that hugged the road. Then finally in the distance I spotted what I’d driven about five hours south from San Francisco to check out: the first glimpse of an endless sea of rows and rows of gray solar panels. It’s a monument of steel poles and sun-worshiping geometry. After close to four years of ongoing construction, plus three years of planning and permitting, the $2.4 billion, 550-megawatt Topaz Solar Farm — the first of this size in operation — is finally finished, and primed to sell power to California utility PG&E. The project is owned and operated by MidAmerican Energy, a subsidiary of Warren Buffett’s Berkshire Hathaway. While Topaz is the first of its kind at this massive scale, it’s actually the first of a series of similarly large solar panel farms that are being built in various locations across California (as well as Nevada and Arizona, too), enabling these states to meet their aggressive clean power mandates and tapping into the powerful sun of the Southwest. And Topaz is interesting not just because it’s the first of these mega solar farms out of the gate in California, but also because the project’s history provides an in-depth glimpse into the evolution of the solar industry, and energy innovation, over the last decade. I pulled off the freeway and walked up to the edge of the solar field that’s closest to the road. It’s surrounded by a chain link fence, topped with barbed wire and a camera perched at each corner. Just inside the fence, the panels — made from a thin layer of the semiconductor mixture cadmium telluride, manufactured by American solar giant First Solar — are pointed south-eastward toward the horizon and the sun, which rose less than an hour ago on this December morning. The panels extend for what seems like infinity — close to 10 square miles in this region — all the way to the horizon, disappearing into the low-lying fog. A sign on the fence warned of possible “electric shock,” “death,” and “serious injury” for anyone who tampers with the panels’ wiring. These panels collectively produce enough solar power for 160,000 average-sized American homes. From the ground level, looking straight into the solar field is kind of like the fable of the blind man and the elephant — you just can’t comprehend the whole picture. For miles in front of me, the millions of panels stretch out across the region, placed in various chunks on both sides of the freeway and strategically positioned around land being used by ranches, homes and a tiny school. There’s little natural elevation around the farm that could provide a solid view from above. The best photos and videos that have been taken over the years, while the solar site was under construction, come from a drone video made by the owner of the solar farm, a plane flyover done by a blogger, and an aerial photo shot by the panel maker. Given that large utility-scale solar panel farms like Topaz take up so much land, their potential to disturb environmentally sensitive land is one of the biggest concerns, and obstacles, confronted when creating these types of sites. Other solar sites, like the Mojave Desert solar thermal farm Ivanpah, faced years of delays and protests after initial surveys underestimated the desert tortoises that lived on the land. A sign for an entrance to the Topaz solar farm. The main endangered animal living on the land of the Topaz site is the kit fox. To avoid delays and litigation, Topaz’s developers purchased extra land for kit fox conservation, and also developed Topaz to be as unintrusive as possible on the surrounding wildlife. From an economic standpoint, Topaz is a boon for the area. The 400 jobs created to build it (reportedly up to 880 workers during peak construction), have reaped a collective $192 million in worker pay, and the project has delivered $52 million in economic output for local suppliers. 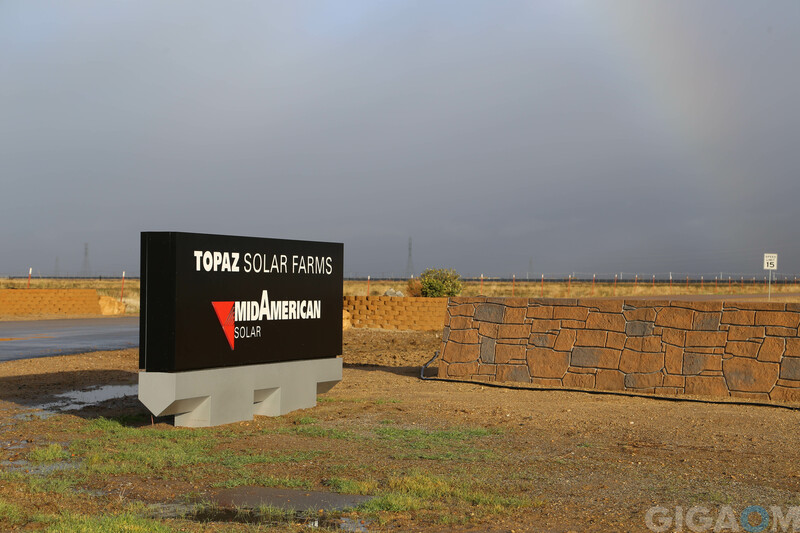 First Solar says there’s an estimated “$417 million in positive impacts,” from Topaz, including property and sales tax revenues for the county, direct and indirect wages, induced spending and supply chain revenues. There are two other important reasons why developers chose this location for the Topaz project. First, the obvious one: it’s hella sunny; it’s one of the sunniest regions in the U.S. And second, there was an existing 230-kilovolt transmission line nearby, which will deliver the solar power far from the site to the homes, offices and factories that will use it. 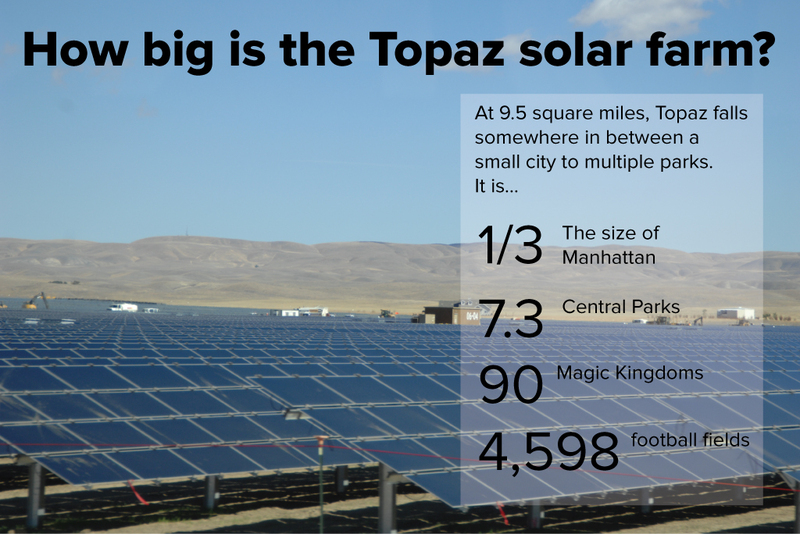 By solar photovoltaic standards, Topaz, at 550 MW of capacity, is huge. But Topaz won’t even be the biggest of California’s mega solar panel farms within a few years. 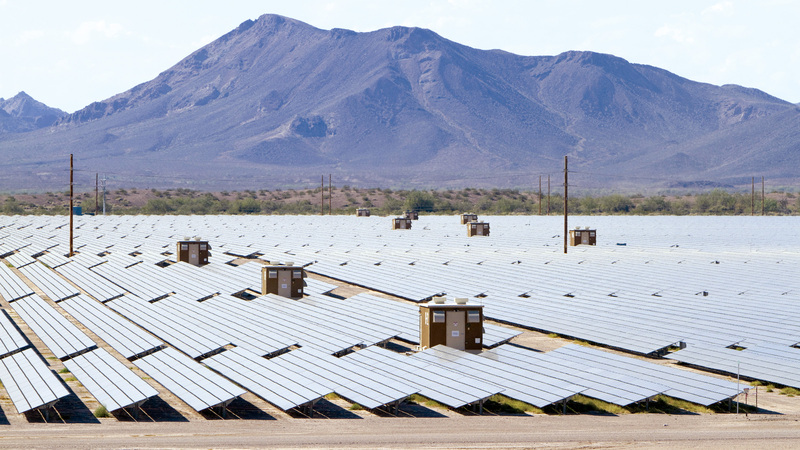 The similarly-sized, 550 MW, Desert Sunlight project was quietly finished in mid-January, a couple months after Topaz. It was built near Desert Center, Calif., in the Sonoran Desert east of Joshua Tree and Palm Springs. 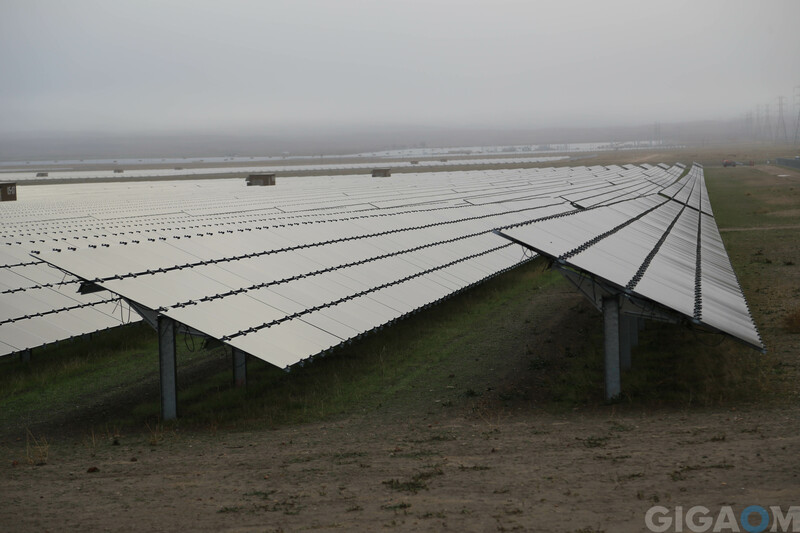 It’s about a five and a half hour drive from Topaz, and was installed on land managed by the Federal Bureau of Land Management, also using solar panels from First Solar. NextEra Energy, GE Energy Financial Services and Sumitomo Corporation of America own that one and the project used guarantees from the U.S. government to back $1.4 billion in loans. Then there’s Solar Star, which at 579 MW (providing enough capacity for 255,000 homes) is expected to displace Topaz as the largest solar panel farm in operation when completed in late 2015 (if it stays on schedule). It’s just a three hour drive from Topaz, and will be made up of two co-located projects in Rosamond, Calif. It’s being built by Bay Area company SunPower, using SunPower’s high efficiency silicon panels, and it’s also owned by Warren Buffett’s MidAmerican. 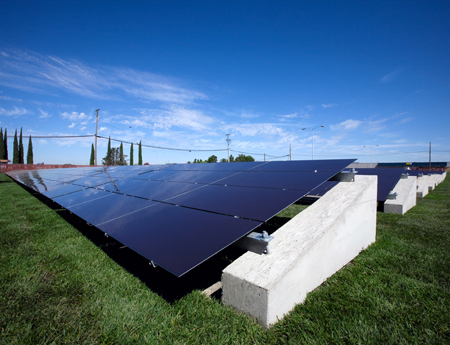 Southern California utility SCE will be buying the power from Solar Star. The largest solar panel project on the books in the U.S. right now, according to the Solar Energy Industry Association, will have 750 MW of capacity, and that project just got the go ahead to start construction on its first phase near Palm Springs, Calif. It’s called the McCoy Solar Energy Center, and will be built by NextEra Energy on mostly federal land. That one won’t be built out for several more years. There are another handful of solar panel projects that have been built in recent years in the American Southwest that are about half the size of Topaz. The Agua Caliente Solar Project, finished at the end of 2013 in Yuma County, Arizona, has capacity to produce 290 MW; California Valley Solar Ranch, also finished in late 2013, near San Luis Obispo, should generate 250 MW. And there’s three solar panel projects under construction in Nevada that will also provide about 250 MW each. These 12 solar projects collectively will be able to provide enough power for close to 2 million average American homes, with enough total capacity for about 4 and a half gigawatts (1 GW equals 1,000 MW). Five years ago, the majority of solar panel power (the small amount that there was) in the U.S. was coming from rooftop solar systems, but now the vast majority of the solar industry is being made up by these mega utility-scale ground-mounted solar panel farms. As of the third quarter of 2014, the SEIA said there were 8.14 GW of utility scale solar panel plants operating in the U.S., with another 14.49 GW contracted (the deals are signed, and some are under construction) and another 27.50 GW worth of capacity announced (but not contracted). According to SEIA, 825 MW of capacity from 67 utility-scale solar projects or project phases were built in the third quarter of 2014 (where we have the most recent data). 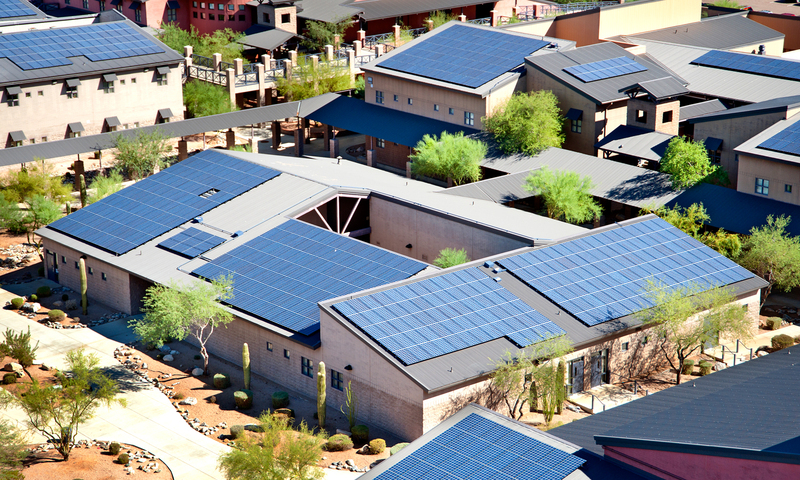 Both utility-scale and rooftop solar projects (called distributed solar) are booming in the U.S. Almost 4 GW of solar panel projects (both utility scale and rooftops) came online in the U.S. in the first three quarters of 2014 (the latest data from SEIA), up from 2.65 GW for the same period in 2013. That amount last year represented over a third of all new electricity capacity built in the U.S., following behind new natural gas plants. For the full year 2014, SEIA estimated there will have been 6.5 GW of solar installed. And this is just the U.S. solar market. According to a new report from Bloomberg New Energy Finance, solar made up almost half of the total global investments in clean energy last year (with $149.6 billion in financing), which was its highest share ever and up 25 percent from 2013. A big chunk of that happened in the U.S., but a big portion came from China, too. Why now and why so large? To gaze upon Topaz is to see one of the main ways that California, and other sunny states like Nevada, will transition to clean power and help reduce carbon emissions from the electricity system. California has one of the most aggressive mandates in the U.S. — called the Renewable Portfolio Standard — and it sets a legal standard that utilities in the state have to deliver 33 percent of their electricity from clean power sources by 2020. It was first established in 2002 via Senate Bill 1078, and strengthened in 2006 and 2011. That means that over the past decade California’s utilities have been struggling and experimenting with tactics to meet this expectation. They’re figuring it out: the state’s three largest investor-owned utilities (PG&E, SCE, and SDG&E) are getting there and hit an average of 22.7 percent clean power as of 2013. And expect the RPS to keep going up. In his inaugural address in January, California’s newly re-elected Governor Jerry Brown called for an increase in the mandate to 50 percent clean power for electricity by 2030. 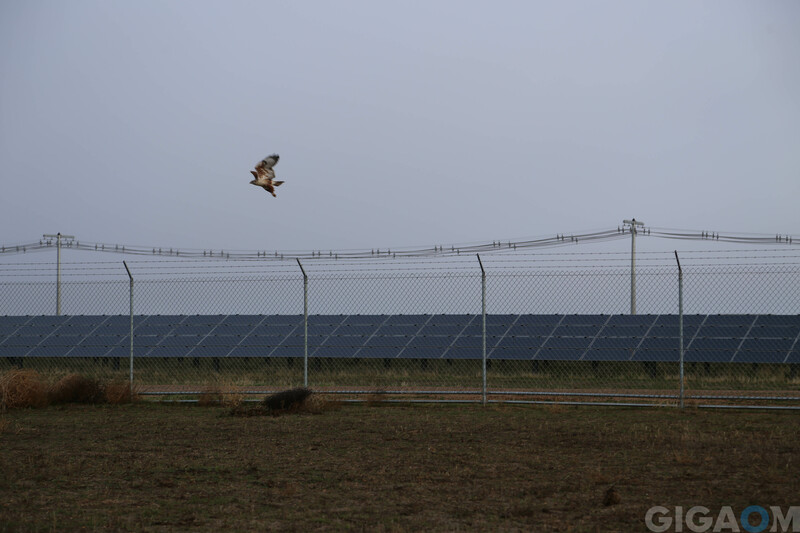 A bird takes off over the Topaz solar farm. Large solar panel farms are now one of the most viable ways for utilities to meet big chunks of the RPS. Wind farms are another option, but windy regions can be harder to come by and many of the best areas have been maxed out with wind turbines already. In Europe, power companies are investing in offshore wind farms, but these have mostly stalled in the U.S. There are a variety of factors that have made solar panel farms one of the best choices for clean power for the electricity grid. Due to a combination of federal incentives, private markets, and a decade of lowering technology costs, right now you can build a large utility-scale solar panel farm in the U.S. for the cheapest price in history: as low as $1.68 a watt, according to GTM Research. 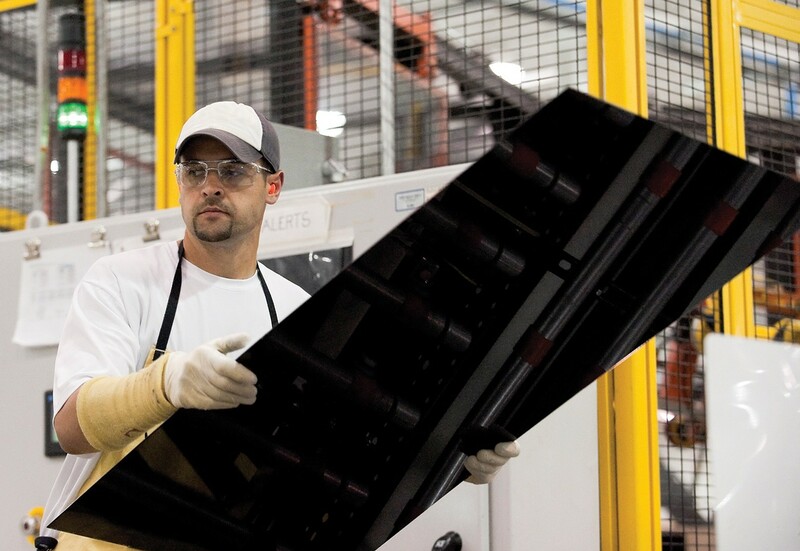 First Solar panel produced in a factory. That price is competitive with the cost of building a new natural gas plant. A utility-scale solar power plant can deliver electricity for between 7 to 9 cents per kilowatt hour, excluding subsidies. The largest new sources of electricity generation in the U.S. are coming from natural gas plants, and efficient new natural gas plants can deliver power for between 6 and 12 cents per kilowatt hour. (PG&E reportedly originally signed the Topaz deal for 20 cents per kilowatt hour in 2008). Building utility-scale solar panel plants is cheaper per watt than installing large rooftop solar systems for companies and organizations, which cost about $2.27 a watt, and it’s far cheaper per watt than installing solar panels on the roofs of homes, which cost around $3.60 a watt, according to GTM Research. Much of the costs associated with solar panel projects don’t come from the cost of the panels themselves, but everything else involved. (See the blended average installation costs per watt below from SEIA). The new economics associated with solar panel farms comes in part from the bare-bones costs of the solar panels these days. The technology has truly become a commodity, just like the semiconductor chip. Huge solar manufacturers in China, Japan, and the U.S. are making these panels in massive volumes, and in recent years they’ve even struggled to make a profit because solar panel costs had dropped so low (though that crunch has lately started to turn into a manufacturing boom). Because solar panels have become a commodity, large institutions and banks are now willing to invest in solar farms and rooftop solar projects the way they have invested in traditional energy technologies. Solar farms are now “bankable,” and they can provide reliable returns to investors. Warren Buffett, whose investment firm owns a subsidiary that owns Topaz, is just the most high profile investor to be bullish on the money-making potential of solar farms. As the price of solar panel projects started to fall in recent years, the U.S. federal government has also stepped in to help provide incentives. The federal investment tax credit (ITC) is a big one, and it delivers a 30 percent tax credit to solar project developers. The ITC has been so important for utility-scale solar development that the threat of the ITC shrinking at the end of 2016 could significantly jeopardize the development of these projects. Analysts like GTM Research’s Shayle Kann predict if the ITC is reduced (it’s due to expire at the end of 2016 but could be extended), it will make these types of utility solar projects uncompetitive with new natural gas projects. First Solar’s Agua Caliente in Arizona. The federal government also provided loan guarantees, backing big loans for some of the first large solar panel farms like Desert Sunlight (but not Topaz). So federal incentives helped some of these first large solar farms access lower costs of capital. The U.S. Secretary of Energy, Ernie Moniz, told me late last year that providing loan guarantees for these early solar panel farms was exactly what the loan program was designed to do and these early farms are a very successful example of how the government can help clean power technology. In essence, the federal guarantees helped a technology that was on the cusp of economic viability become viable, Moniz explained. But now that solar panels are even cheaper than they were back then (the loan guarantee for Desert Sunlight was finalized in 2011), the DOE won’t likely provide a loan guarantee on this scale for a new utility-scale solar farm, he said. Combined with the new lows in panel prices, utilities can also find solar panel deals attractive because they can buy the power from these solar farms at a fixed rate over 25 years or so. That means if the price of natural gas or other energy resources all of a sudden shoots up, the utilities know that they have a fixed deal for at least part of their electricity source. Large solar panel farms have some of the most reliable and predictable costs, because after the initial investment the source of the electricity (the sun) is static and free. Until recently, conventional wisdom held that utilities would find a big chunk of the solar capacity they sought in solar thermal plants (sometimes called concentrating solar farms). These farms use mirrors to concentrate the sun’s rays to heat liquid to run steam turbines. But as the price of solar panels dropped over the years, these solar thermal sites have increasingly been replaced with plans for solar panel farms. If you go back seven years and look at the early inklings that became Topaz, a small part of the project was originally intended for one of these mirror-laden solar thermal farms. But a much bigger part of Topaz was once under development in 2008 by a fly-by-night solar startup whose big idea was to manufacture its own solar panels at a massive scale using off-the-shelf technology but production lessons from the computing and chip industries. Cleantech old-timers will remember OptiSolar, which was one of the first cleantech boom-and-bust startups that suggested there might be a lot of difficulties ahead for capital-intensive, manufacturing-focused energy startups. The company, founded in 2005 by HP scientist Marvin Keshner and Rajiv Arya, had a goal of making solar panels for $1 a watt using amorphous silicon (an older technology), and using manufacturing ideas from a paper published by NREL. The company managed to raise hundreds of millions of dollars from private equity investors, and even back then — when the Valley was going crazy over cleantech deals — the cleantech-focused VCs of Silicon Valley weren’t involved with the firm. But the deal was representative of the type of investments that were being done at the time in the Valley. Solar manufacturing startups Solyndra, Miasole, and Nanosolar all raised hundreds of millions of dollars from VCs starting around this time. In early 2008 OptiSolar announced it was developing a 550 MW solar farm dubbed Topaz, and it planned to build the project with its own installer subsidiary, called Topaz Solar. At that time, California utilities didn’t really know how they were going to meet the newly-strengthened legal mandates in such a short time frame, and some of their early deals (space solar?) were questionable. 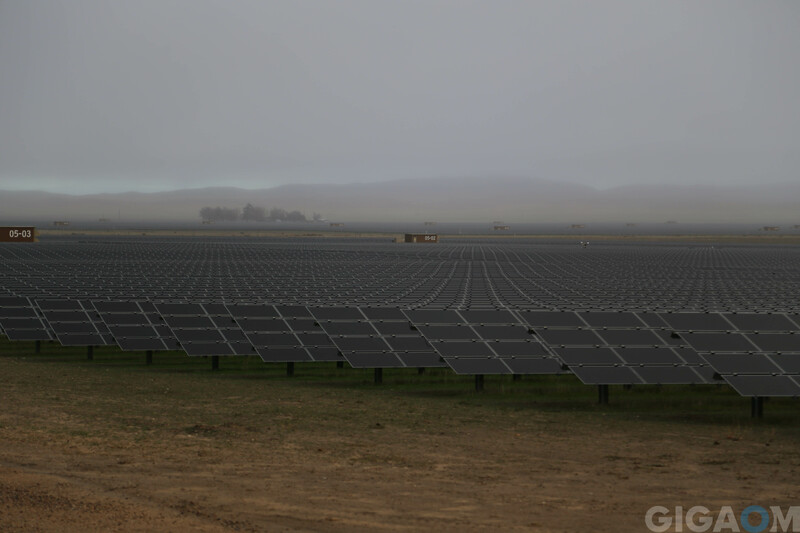 In 2008, PG&E surprised the world by announcing it had struck a deal with OptiSolar to buy the power from the Topaz Solar farm. At one point OptiSolar was supposed to employ 1,000 workers to make 600 MW worth of solar panels a year at its factory in Sacramento County, and the factory’s ribbon-cutting ceremony was attended by then-California Governor Arnold Schwarzenegger. But the company had outsized ambitions, a questionable plan, and truly unfortunate timing. The credit crunch took the wind out of the sails of most of the financing needed to execute on such an ambitious project. The same financial downturn also almost killed then-young Tesla Motors during this time. Just a year later, OptiSolar laid off half of its staff, halted manufacturing and hawked its “crown jewel” — the Topaz solar project — to First Solar. Around then, First Solar also bought up a cancelled solar thermal project planned by startup Ausra nearby and reconfigured the project layout of Topaz to be what it is today. Two and a half years later First Solar sold the project to Warren Buffett’s MidAmerican, but retained the panel supply deal. The rest is history, written by the maturation of the solar industry: solar panel prices dropped, and the project slowly got built. The folks behind OptiSolar a few years later tried to resurrect as NovaSolar, but that also later went out of business in 2012. Today, the state of the solar panel farm industry is a far cry from these high risk days of OptiSolar. And you can expect to see many more of these large solar panel farms to cover many more miles of land in the Southwest, as well as other sunny areas of the U.S. and across the world. Some of the biggest opposition for the biggest utility-scale solar panel farms these days isn’t from technology, economics or risky young startups, but from environmentalists pushing to restrict land use. These environmental considerations are one reason why these mega solar panel farms might get considerably smaller in the future — there’ll probably be more of them but they’ll have potentially smaller land needs. Smaller solar panel farms — think tens of megawatts instead of hundreds — could be more easily and strategically placed on land that’s already being used by industrial concerns. The land needs of these mega solar farms are also one reason why some people are more excited about distributed solar panel systems on the rooftops of homes, businesses and organizations, as opposed to these centralized utility-scale solar panels farms. Solar panels on distributed rooftops don’t take up extra land, and can provide electricity specifically for the occupants. These rooftop systems, particularly when paired with a battery, also can provide consumers and organizations a way to basically ditch their utilities, if they feel so inclined. While rooftop solar systems deliver less solar power than utility solar farms do these days, down the road that could flip and the collective capacity from rooftop solar systems could become substantially larger. When that happens, it will be a challenge for utilities to move from a centralized clean power system to a distributed one, requiring significant investment in their grids. According to a “grand plan” devised by the magazine in another issue, 69 percent of the electricity in the U.S., and 35 percent of its total energy, could come from centralized solar panel systems by 2050, for a cost of $420 billion between 2011 to 2050. It’s not all that much money if you consider how much the U.S. spends on things like, for example, the Afghanistan war (over $640 billion). Elon Musk — now famous for being the CEO of Tesla Motors, founder of rocket ship company SpaceX, and the Chairman of SolarCity — told me back in 2008 that by 2030 he thought that solar power will be the single largest source of power in the U.S., and possibly the world. While that might be ambitious in terms of timing, I think we can get there one day. The Topaz site is really just the start to this sunny revolution. As I arrived back home in San Francisco after my tour of Topaz and the many-hour drive north, the 9 million panels that make up the site will have converted the days sunlight into electricity, pumping substantial carbon-free electricity onto the grid. It might be a small source for PG&E, but for the coming clean power transition, it’s a game-changer. Updated the last paragraph at 5:54PM on January 21 to correct that the panels at Topaz are at a fixed tilt, and are not on trackers. Good start, now California needs to make their own water. Did I pay for this through subsides? I would love to hear more about the cause of price drops: are these just business cycles, taxes, better manufacturing processes or improvements in designs of the solar cells themselves? Is it true that the basic solar cell sold today is nearly the same as it was some 10 years ago? Whatever happened to those countless ‘breakthrough’ new technologies we often read about new ‘revolutionary’ solar cells that would double/triple energy efficiency? Those numbers don’t make sense. How can an increase of 29 MW (5.3%) support an additional 95,000 homes (59.4%)? Very impressive article. Thank you. I have a small sun power farm on my roof of 20 panels that produce almost sufficient electricity for my needs already for 5 years. I am still amazed how silently they work and produce without any maintenance. The cost for this set-up was less than the cost for a recent one month vacation in California for two persons. I start to believe that new ways of constructing houses (roof types adapted to install panels) will easily contribute to the overall energy production for a large proportion. Therefore, mentioning Solar City (Elon Musk) is most meaningfull. Solar energy is diffuse, will always be diffuse and therefore captation needs to be diffuse. Big is NOT always better. How could this story mention Elon Musk, who is not involved with utility-scale solar installations, and not Mike Ahearn, John Walton, or True North that were key players in First Solar? Since when did an electrical power generation facility become an agricultural operation. There is nothing agricultural about a power plant. We don’t call a Costco a “big-box farm” were don’t call a auto mall an “car farm”. Certainly some residential subdivisions have taken the name of the farm it paved over. This is just PR hype from the solar developers that the author apparently bought into hook, line, and sinker. There’s a parallel between a solar farm and a regular farm that seems to have gone over your head. In both cases we are using energy from the sun to produce something else. On an agricultural farm, we are producing goods, and on a solar farm we are producing energy. You’re right that we don’t refer to “car farms”, but then again we don’t refer to fields of corn as factories either. Solar panels is our next generation source of energy that seems to be far efficient and also cost-effective. Thanks for sharing this great news!! These large solar farms are trying to force new technology into an outdated centralized business paradigm. Solar is meant to be distributed on the rooftops near the consumers, avoiding transmission losses as well as taking up acres and acres of land. It seems to me that a blended approach is best. Especially as we transition to renewables. Not all roofs point in the right direction or are free from shading. One size does not fit all. The Cal PUC is requiring battery storage requirements (1325 MWH) be installed in the next few years (2020). I wouldn’t stop these types of solar installations and with the mandate CA will be first to require storage. These installations don’t have battery back up and are therefore dependent on fossil fuel plants to supply 100% of the grid when clouds cross the sun or the sun goes down. The ones in Hawaii are more interesting because they can actually deliver reliable power (or are at least trying to). It is a little deceptive to ignore the costs of building gas turbine plants to back up the solar cells. The economic claims look muddy but the consumers in California will know soon enough when they see their electric bills. Weather forecasting is so fantastic these days, and promises to get continually better. What this means is there is a forecast of power ability going as far into the future as the weather report, with equivalent accuracy. This will help price power out to a week or 10 days or more, as well as the price of accompanying gas service. Nobody can as easily predict interest rates 10 days ahead, or the price of a barrel of oil. As Germany has found out as it has increased peak electricity production past 50% with renewables, these variances are very much predictable. Utilities play the prediction game everyday anyway and are good at it. Good luck finding a battery backup or other energy storage that will compensate for the sun going down. 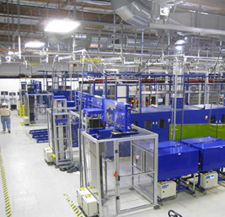 Battery storage or other energy storage schemes will be for supply smoothing only. These solar projects are only being implemented as they become financially viable, a large part of this article you evidently skipped over. Solar PV dovetails very nicely with the daily demand cycle of grid electricity. They produce at highest capacity when the sun is up and the days are long in the summer, exactly when the a/c’s are running full tilt in Los Angeles. Cool, cloudy and shorter winter days don’t produce nearly as much, but then who’s running the a/c then? Solar thermal towers like Ivanpah, or solar thermal SEGS at Mojave continue to produce electricity after sunset as demand for electricity decreases. I think the right way to deploy solar is at the point of use. What does a carport cost? Now add a solar system and an old, used up electric car battery. Now you have everything you need to fuel the car right on top of where it’s parked. Not only no powerline losses, the price isn’t going up, and up, and up, as time goes by. Instead, the more you use, the less it costs. But Noooooooo! Instead, we have these huge, environmentally destructive, utility scale installations BUILT ON THE GROUND instead of atop buildings. There is only one reason for these things. It is so a single capitalist can jump up and down in front of it shouting, “Mine, Mine, Mine Mine, Mine!! !” like a three year old. And of course, jack your rates annually. Economies of scale are essential. It means less cost per watt, less labor needed, and ultimately less land needed. Also, you get to deploy the cells where they get the most sun. The amount of land needed by plans is infintesimal considering the size of these regions. Considering the net environmental benefit, and the fact that wires can get the power anywhere instantly, it’s a no-brainer. Thanks for nice long article with some dissection of solar segment costs, project histories, and evolution. My only add on comments are 1) Forcing Topaz owners to surrender the property to the environmental road block groups should have been included in the discussion of permit costs and time delays for an otherwise fast completion story for solar PV versus all other types. 2) It is a waste of even electronic news space to included a graph on the blended price of solar. 3) Inclusion of the next evolutionary phase of solar PV would have been nice. It is community solar and it fits between utility scale and rooftop for space requirements and economies of scale. It does open a whole new world for investor types beyond DOE and Buffett. See Clean Energy Collective for an example with strong financial backing out of the chute. The US could save a lot by pushing for efficiency but there is no such push and given the political climate, it’s unlikely. It’s easy to set limits for idle power for set top boxes but not so much when the leaders are corrupted. It’s easy to list power consumption for appliances in stores, transition to LED lighting, up tax on gas and power hungry cars, invest in glasses to replace TV,s and much much more. Some shifts are organic but others could use a helping hand. The demented congress even managed to more or less kill the light bulb efficiency standards. , because adoption of LED wasn’t slow enough. Transportation is maybe 30% of total energy consumption in the US, what’s being done there? A handful of electric cars on the streets has no relevance. Smaller cars , fewer car trips , a shift from trucks to trains would make a huge difference. But nothing that bothers anyone with money can be done in the US. Except it does not know how to push solar appropriately and then plays heavy handed political program intervention when it does, as in Solyndra finance. Get the government out of the economy. No subsides – none. Hitler was a central planner’s central planner. Competition and free enterprise is the best practice. thanks for the great article Katie! I think you missed a negation in there. You have “also developed Topaz to be as intrusive as possible on the surrounding wildlife.” Probably meant the opposite…yes? yep. thanks for pointing out, we tweaked that. The people who complain about environmental impact don’t seem to complain about the impact of mining or ATVs, and are adamant about rolling back federal regulations designed to protect the desert ecosystem. Looks just like a straw man. So to be clear, you support the banning of ATVs and the strict regulation of mining and other use by the federal government? Yes or no question. Now that I’ve answered you question, perhaps you could answer mine.